Sound Multimeter is an iPhone app that lets you test the level and frequency of sounds in your area and map the results. 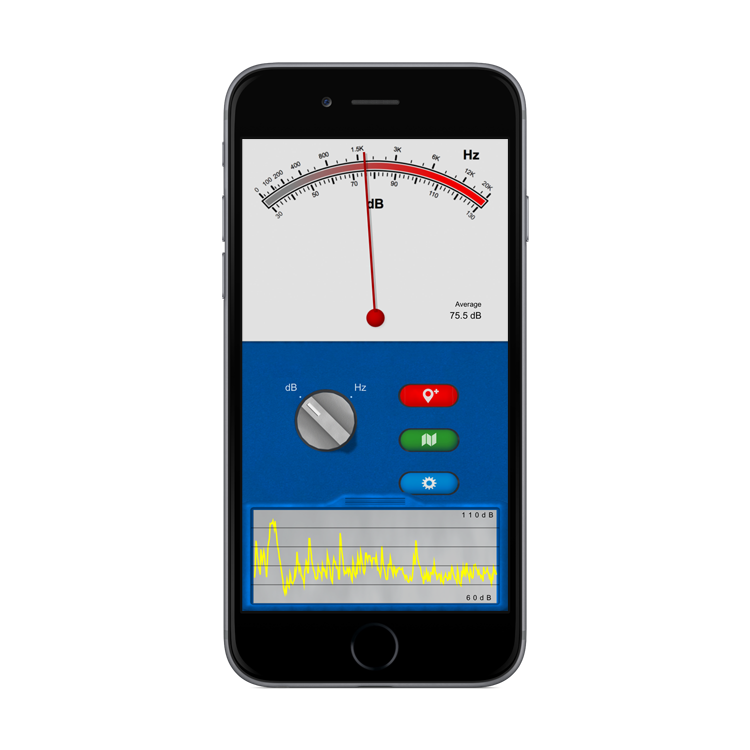 Sound Multimeter uses your iPhone's microphone to test the sound level in decibels (dB). Sound Multimeter was designed for iPhone and iPod Touch devices running iOS 8 or higher. iPads with iOS 8 or higher are also supported. What are "dB" and "Hz"? "dB" is short for "decibel" which is a unit to measure sound level. When the rotary switch is in this position Sound Multimeter displays the average sound level. For example a library is 40 dB, a typical dishwasher is 80 dB, and a thunderclap is 120 dB. "Hz" is a short for "Hertz" which is a measure of frequency. For example in North America electrical hum is 60 Hz, middle C on a piano is 261.63 Hz, and an ambulance siren is typically around 700 Hz. Whistles and hisses will be much higher. To change between dB and Hz tests touch or drag the rotary switch. How do I read the display? The needle works much like the old analog multimeters used to test voltage and current. Further to the right means louder or higher frequency sounds depending on the position of the rotary switch. The lower row of numbers show the loudness in decibels (dB). Higher numbers indicate louder sounds. The upper row of numbers show the frequency in Hertz (Hz). Higher numbers indicate higher frequency. How do I show the graph? Simply tap or slide up the tab at the bottom of the screen to reveal the recent dB levels or frequency spectrum depending on the position of the rotary switch. Tap again or slide down to hide it again. Touch the blue configuration button to change the settings. There you can offset the decibel reading to fine-tune your results, set to automatically record the location and levels at predefined intervals, and turn on or off the text tips at the bottom of the main screen. With Sound Multimeter you can save the level and frequency information along with your current GPS location. That occurs by tapping the red "save placemark" button. The button will remain lit if in the settings you've configured to automatically record the location and levels at predefined intervals. What does the green button do? The green map button displays the saved placemarks containing the location, level, and frequency of your sound readings. Simply tap a placemark to see its data. You can also copy that data into your device's clipboard by tapping the "copy" button. Can I remove the saved placemarks? Yes, simply tap the "reset" button at the top right of the map view and confirm that you'd like to remove all historical data. Note that this cannot be undone.